It was Aamir’s birthday and the first day of the rental car with driver (we had called the driver even though it was Sunday, a holiday for him). 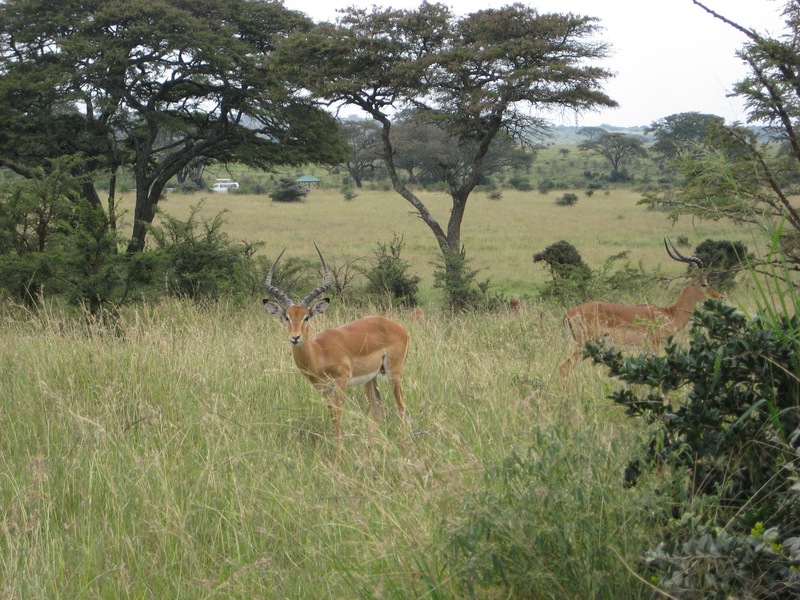 What better day to initiate safari in Kenya. We decided to go to Nairobi National Park, the nearest safari point from Nairobi. Before experiencing this park, I could not imagine that wild life can exist so near an urban city. With good traffic, the place is just twenty-twenty five minutes drive from our home. 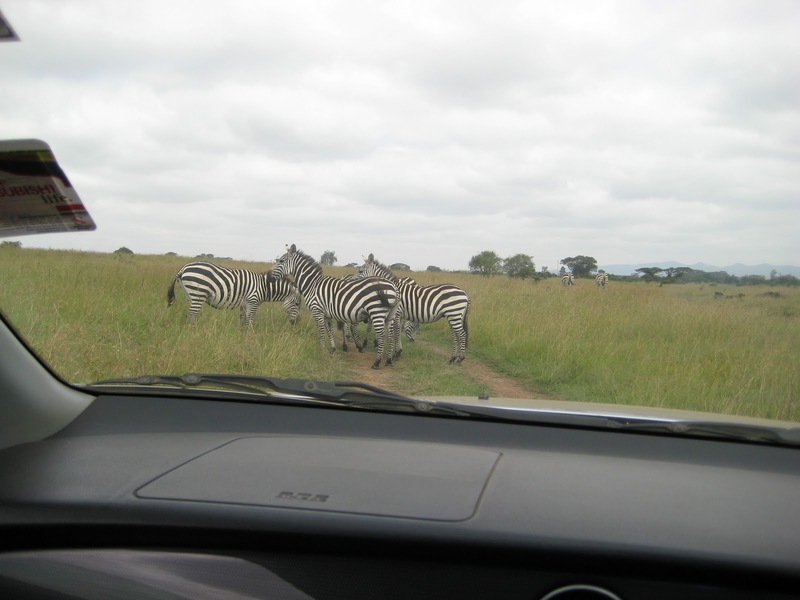 It was to be our first brush with Savannah grasslands and zebras and antelopes; and we were excited about what we were about to see. It felt like a dream – few months back we were in India and there we were - doing the African jungle safari! We had barely entered the park when we found a giraffe blocking our way - meditating right in the middle of the road. It seemed to know very well that it had the right of way over us. 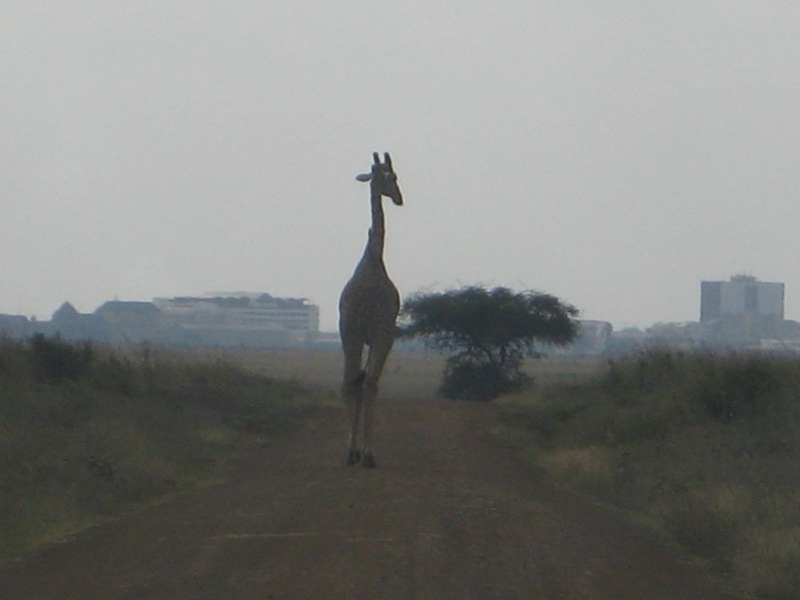 After waiting for some time, since the giraffe was not budging, the driver decided to back the car and take another route. 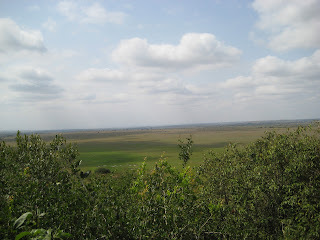 We soaked our eyes in the Savannah grasslands all around us. Really tall grasses, but we are told that these grasses can grow very tall - sometimes tall enough to hide a car depending on the season (we are yet to see such extraordinary heights). We could see so far away and so much of the blue sky decked with white clouds. Open expanses were all around us, although some areas reflected the urban backdrop. 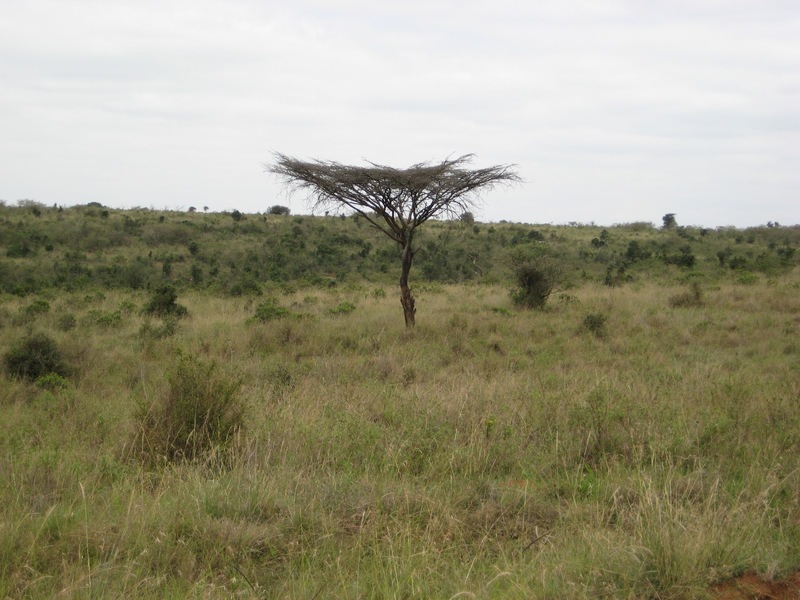 Scattered acacia trees stood lonely along the way spreading their umbrellas on the grasses. This is so different from Indian jungles where trees merge to close the canopy above. Scene straight out of "Out of Africa"
The giraffes were plenty in number, but the hordes were those of zebras (Kiswahili Punda milia) and antelopes: Thomson’s gazelles (Kiswahili Swala Tomi) with black stripes on the side, impalas (Kiswahili Swala Pala) with the curved spiralled horns – strolling, running, chasing, idling, grazing all around. These are really beautiful animals, original works of body painting (now we know where the inspiration for the art comes from). One can not but marvel at them. The animals appeared to be very healthy and strong; Mother Nature seems to have plenty to feed them for now (I pray they keep getting the bounty year after year). 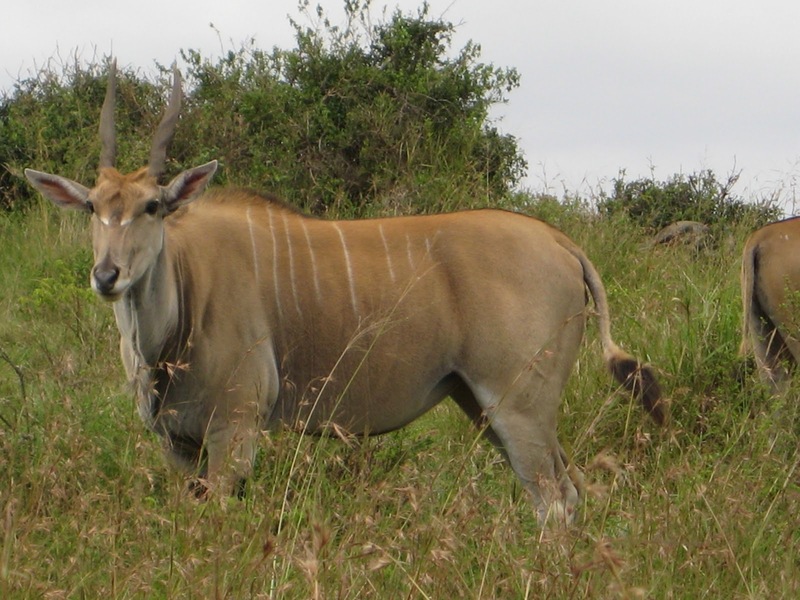 Eland (Kiswahili Pofu), the biggest antelope, with its muscular heavy body and pointed horns was a revelation – certainly not the sleek shape that comes to mind when we think of antelopes. There were plenty of birds as well – guinea fowls, ostriches etc. Out of the big five, we could see African buffaloes in large numbers. These heavier cousins of domestic bovini family tribes are not to be taken lightly at all. Some of the stares they give are deadly. The animals are quite used to vehicles all around them; they try to avoid them as much as possible. 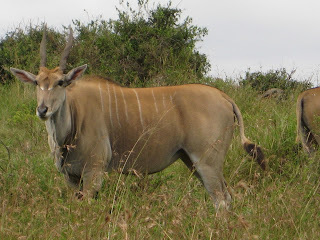 I could not believe that after some time we could be in a state where we say “oh just another group of zebras”, “oh just another bunch of antelopes” as if this was an ordinary occurrence. But that was indeed the case – we had our fill of the animals and it was not long before Adi went from a state of amusement to boredom. The journey through out has to be on a vehicle. We are allowed to get down only on designated picnic spots or view points. We had our packed lunch in one such picnic spot. The driver educated us on the facts that Nairobi was all Masai land and the men who marry Masai women are very lucky - they are the most well behaved of all women in Kenya (although cross tribe nuptials are a relatively recent phenomenon). Adi’s first jungle safari turned out to be a memorable one (with all these wild encounters he can blabber out the names of animals that he has seen with practiced speed) – although it is another matter that his memory will fade over time. It is very much Aamir's and my safari now; Adi would have to do his own safari when his time comes. We did not come across the remaining four of the big five (lion, leopard, rhino and elephant). After having been to Masai Mara later, this park would probably not be rated too high in the must see places. 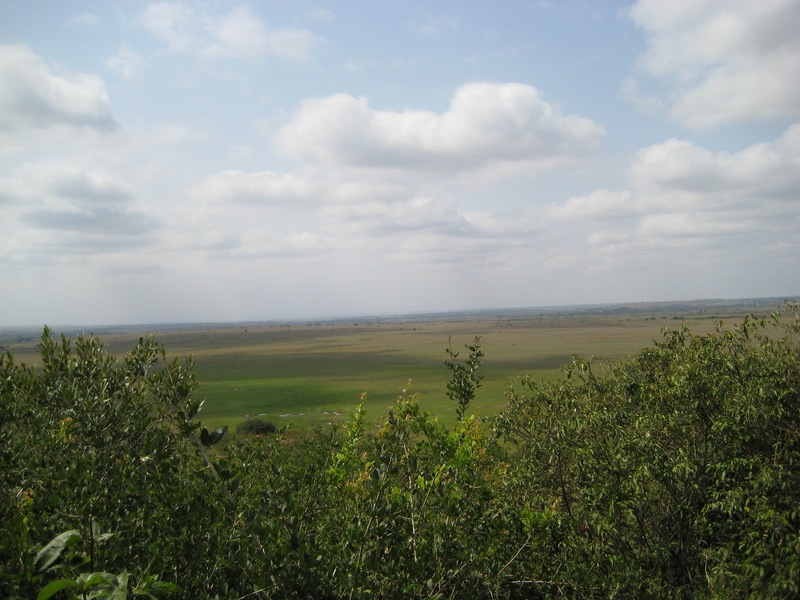 Still Nairobi National Park is special for us considering it was our first African jungle safari and considering its proximity to where we are located. So much wild life, so within reach, literally - we can almost touch them! There is an ivory burning site within the park containing burnt ivory ashes. In 1989 the former president of Kenya, Daniel Arap Moi lit a dramatic ivory bonfire, to torch 10 tons of ivory worth Kshs 60 million, in a bid to eliminate the mass slaughter of Africa's elephants for their tusks. Since then, the fire has been lit twice more to burn confiscated stocks of poached rhino horn and ivory. A plaque reminded us "Great objectives often require great sacrifices” – hope there would not be any more sacrifices required from elephants and rhinos. The animal orphanage outside was a nice place to see. The attendants showed off the well rehearsed tricks with animals. Aamir was keen to have his picture shot while stroking a cheetah (apparently this does happen some times in the orphanage, there are photos in the internet). The attendant with whom we enquired replied that it was not possible then – probably due to lack of trust worthy safe cheetahs. Two incidents really made the orphanage travel memorable. First one: all of a sudden we could see a baby gazelle strolling outside the cages. The animals that are deemed safe (e.g. baby antelopes) are allowed to stroll at leisure in the orphanage, they need not be caged. The presence of this baby gazelle caused quite a stir inside the cages. All the cheetahs and lions tried to follow the gazelle with muscles tensed as if going for a kill – only if there were no barriers in between. Some commotion it was! 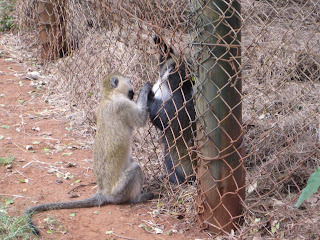 Second highlight: the monkeys all around were scratching themselves. But it was a first when we saw one monkey outside the cage scratching another one inside the cage – both belonging to different species - a vervet monkey scratching a sykes monkey across the barrier! Later I came to know there is a safari walk near the park entrance - we missed that when we went. All the more reason to head back to the park again – especially since I have resident re-entry pass now and need not shell out the tourist entry fee! PS Photos of a later trip to the park can be found here. Kiswahili name for African or Cape Buffalo is Nyati or Mbogo.